Brianna Heese, a grad student from Missouri, incorporated elements of Oregon history in her concept of the landscape design. 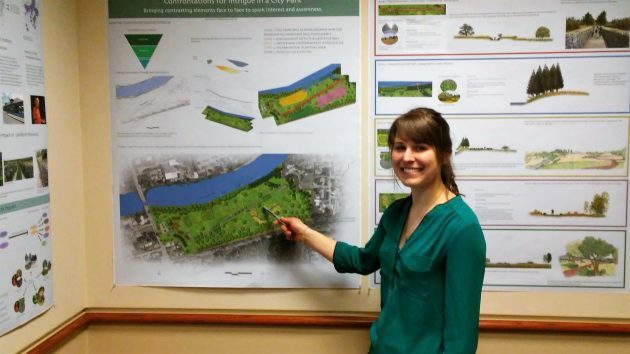 It took each of 13 graduate students in landscape architecture only a few weeks to come up with a different concept of how Albany might some day develop the East Thornton Lake Natural Area. 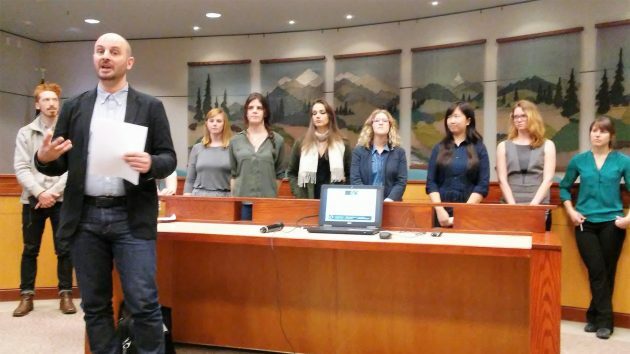 They got the assignment in January, and on Friday they showed their plans to a small but appreciative audience at City Hall. 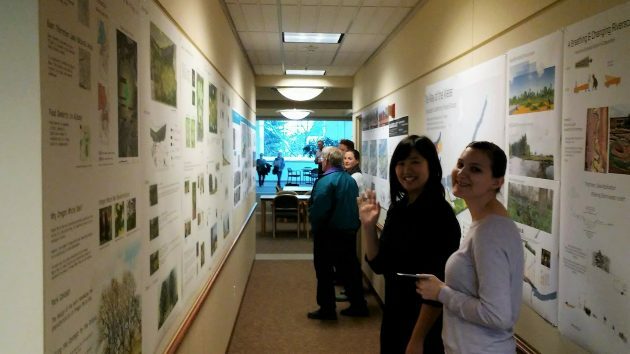 The students are in the first year of their master’s program in landscape architecture at the University of Oregon. Their class took part in the Sustainable City Year Program, a partnership with the city of Albany to study and make recommendations on all sorts of issues identified by the city. Ed Hodney, parks and recreation director, said the students’ work represented an “incredible array of ideas.” Their concepts may come in handy once the city hires a consultant to draft a master plan for the East Thornton Lake acreage. Albany bought the 27 acres of former farmland on the south bank of East Thornton Lake in 2009 for $2.25 million from a Salem developer. Neighbors had fought the developer’s plans for a big subdivision there, and the city purchase ended the land-use fight. In complexity and imagination, some of the students’ proposals seemed to go beyond the thought when the land was bought that the area be left mostly natural, as the name implies. But this was an assignment, so they showed more innovation and creativity than you’d think are necessary to leave a natural area alone. Instructor Jacques Abelman and some of his landscape design students in the Albany project. 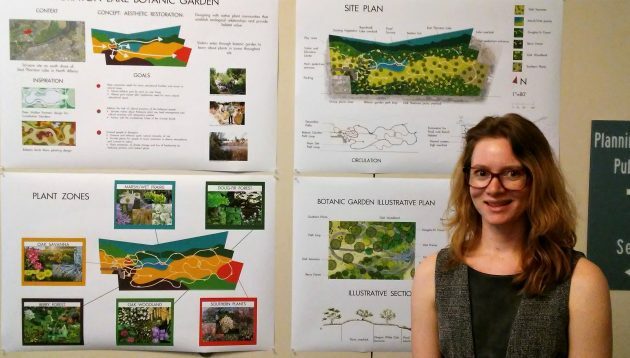 Deanna Lynn, of Monterey, CA, proposed the idea of a botanical garden. Some of the concept-explaining posters were displayed in the upstairs hallway at City Hall. What part of “natural area” do the councilors not understand? Tony… At this point, this has nothing to do with council. I strongly applaud their forward thinking. What this council (or any future council) may do with any (or none) of their concepts remains to be seen. Absolutely nothing wrong with imagination, vision and presentation. All in the name of quality, college credit. Those ducks sure are up in the business of Albany. Just the other day I took their Albany livability survey. The online version and now I get the same survey in the mail. Woohoo! My opinion will count twice. Survey Fraud?